A note from Goldman Sachs pees all over gold fever (via Prag Cap). As for the theory that gold is your only protection against the end of the world, Goldman calls this a “religion.” Actually, gold benefits from a strong investment market and suffers in a poor one. [W]hile investors may trade gold as a dollar or inﬂation hedge, its performance in that capacity has been spotty historically. More speciﬁcally, changes in the dollar explain only 16% of the changes in gold, while shifts in real rates explain another 12% and CPI accounts for a mere 18% (Exhibit 42). Thus, these typically cited justiﬁcations for owning gold account for less than half its historical price movements! Furthermore, in 60% of the episodes when inﬂation surprised to the upside in the post-World War II period, gold has actually underperformed inﬂation. 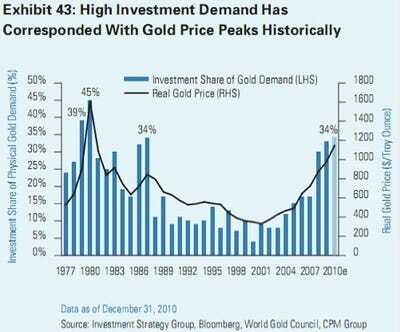 As a result, gold has not been a consistent inﬂation hedge, although it is purchased as one en masse. Of equal importance, investors purchasing gold as a form of tail risk insurance against monetary debasement should appreciate the potential effectiveness and costs of that insurance. For instance, during the recent ﬁnancial crisis, gold actually declined over 30% from its peak in March 2008 through its trough in November 2008, while the dollar served as the better safe haven, rallying 24.3%. Furthermore, gold prices have already advanced on expectations of high inﬂation and dollar weakness, suggesting that the failure of either to materialise, as we expect, could lead to downside risk. In addition, gold has volatility similar to equities, and has, in fact, experienced a larger peak-to-trough decline in price when compared to equities over rolling three-year windows since 1969 (-64.5% for gold vs. -56.8% for equities).